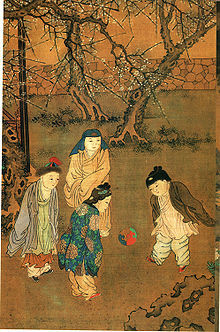 Cuju or Ts'u-chü is an ancient Chinese football game, also played in Korea, Japan and Vietnam. It is a competitive game that involves kicking a ball through an opening into a net. The use of hands is not allowed. Invented in the Han Dynasty, it is recognized by FIFA as the earliest form of association football for which there is evidence, being first mentioned as an exercise in a Chinese military work from 3rd–2nd century BC. The first mention of cuju in a historical text is in the Warring States era Zhan Guo Ce, in the section describing the state of Qi. It is also described in Sima Qian's Records of the Grand Historian (under Su Qin's biography), written during the Han Dynasty. A competitive form of cuju was used as fitness training for military cavaliers, while other forms were played for entertainment in wealthy cities like Linzi. During the Han Dynasty (206 BC – 220 AD), the popularity of cuju spread from the army to the royal courts and upper classes. It is said that the Han emperor Wu Di enjoyed the sport. At the same time, cuju games were standardized and rules were established. Cuju matches were often held inside the imperial palace. A type of court called ju chang was built especially for cuju matches, which had six crescent-shaped goal posts at each end. The sport was improved during the Tang Dynasty (618–907). First of all, the feather-stuffed ball was replaced by an air-filled ball with a two-layered hull. Also, two different types of goal posts emerged: One was made by setting up posts with a net between them and the other consisted of just one goal post in the middle of the field. The Tang Dynasty capital of Chang'an was filled with cuju fields, in the backyards of large mansions, and some were even established in the grounds of the palaces. Soldiers who belonged to the imperial army and Gold Bird Guard often formed cuju teams for the delight of the emperor and his court. The level of female cuju teams also improved. Records indicate that once a 17-year-old girl beat a team of army soldiers. Cuju even became popular amongst the scholars and intellectuals, and if a courtier lacked skill in the game, he could pardon himself by acting as a scorekeeper. Cuju flourished during the Song Dynasty (960–1279) due to social and economic development, extending its popularity to every class in society. At that time, professional cuju players were quite popular, and the sport began to take on a commercial edge. Professional cuju players fell into two groups: One was trained by and performed for the royal court (unearthed copper mirrors and brush pots from the Song often depict professional performances) and the other consisted of civilians who made a living as cuju players. During this period only one goal post was set up in the center of the field. Bronze mirror dating to the Song Dynasty. 15th century Ming Dynasty depiction of cuju, from a printed book of the Water Margin. 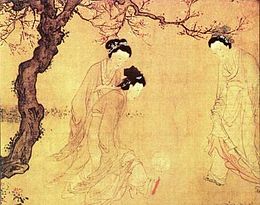 The Yongle Emperor (r. 1402–1424 AD) of the Ming Dynasty observing court eunuchs playing cuju. Kemari festival at Tanzan Shrine, Nara city, Nara Prefecture, Japan, photographed in 2006. Historically, there were two main styles of cuju: zhuqiu and baida. Zhuqiu was commonly performed at court feasts celebrating the emperor's birthday or during diplomatic events. A competitive cuju match of this type normally consisted of two teams with 12–16 players on each side. Baida became dominant during the Song Dynasty, a style that attached much importance to developing personal skills. Scoring goals became obsolete when using this method with the playing field enclosed using thread and players taking turns to kick the ball within these set limits. The number of fouls made by the players decided the winner. For example, if the ball was not passed far enough to reach other team members, points were deducted. If the ball was kicked too far out, a large deduction from the score would result. Kicking the ball too low or turning at the wrong moment all led to fewer points. Players could touch the ball with any part of the body except their hands, whilst the number of players ranged anywhere from two to ten. In the end, the player with the highest score won. Cuju began to decline during the Ming Dynasty (1368–1644) due to neglect, and the 2,000-year-old sport slowly faded away. In the 10th century, a cuju league, Qi Yun She (齊雲社） (or Yuan She), was developed in large Chinese cities. Local members were either cuju lovers or professional performers. Non-professional players had to formally appoint a professional as their teacher and pay a fee before becoming members. This process ensured an income for the professionals, unlike cuju of the Tang Dynasty. Qi Yun She organised annual national championships known as Shan Yue Zheng Sai (山岳正賽). The Hong Kong TVB series A Change of Destiny featured at least one episode based on the cuju competition. Bagua concepts were also used to jinx the opposing team. However, it followed more of the modern football rules than the ancient rules of the game. John Woo's epic film Red Cliff features a cuju competition with Cao Cao and others observing from the sideline. ^ a b "History of Football - The Origins". FIFA. Retrieved 29 March 2019. ^ a b Riordan (1999), 32. ^ "Star Wars tops Xmas toy list". msn.com. ^ a b c Benn, 172. Summary in English pp.181-178. in French pp.185-182.